The Florida Department of Transportation recognizes that a partial signalized Restricted Crossing U-Turn, or RCUT, on Philips Highway at Reba Avenue and Putnam Avenue is the most practical solution to improve the ability of pedestrians to cross the highway, in addition to also managing traffic flow on Philips Highway north and southbound. A partial signalized RCUT will allow for a pedestrian crossing to the south of the Putnam Avenue intersection and another to the north of Reba Avenue. An RCUT is an intersection with traffic signals that specifically allow motorists to make a left turn or U-Turn, while simultaneously the signals will also allow pedestrians to safely cross the intersection. Although this project was intended to facilitate just one pedestrian crossing initially, the FDOT believes the partial signalized RCUT concept would work best by additionally providing two pedestrian crossing options. The partial signalized RCUT concept eliminates the left turn movement for southbound Philips Highway into the Centerfold Lounge, allowing for a U-turn at the Putnam Avenue intersection. This will eliminate the need for signalizing the driveway of the Centerfold Lounge. 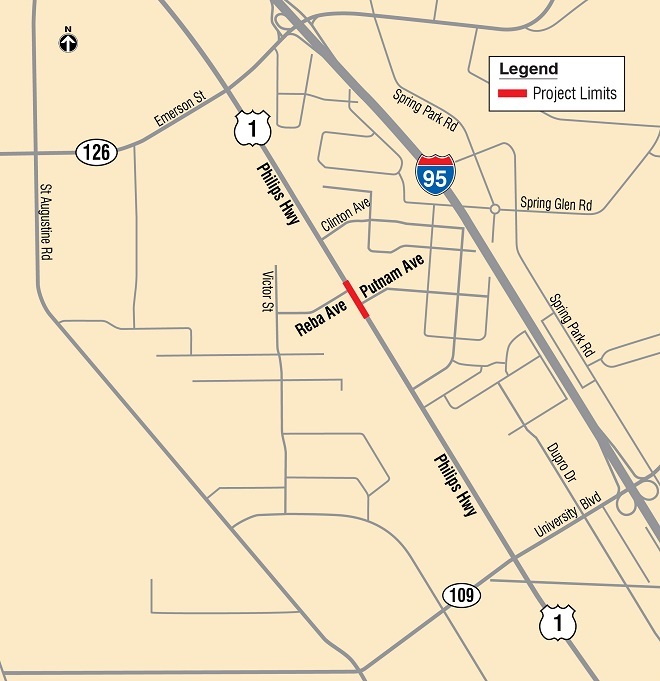 The FDOT recognizes that the partial signalized RCUT concept is best-suited for this situation and looks forward to providing pedestrians and motorists with a safe an optimal solution to crossing the traffic lanes on Philips Highway at Putnam and Reba Avenues. A Public Hearing regarding proposed changes to Philips Highway at Reba and Putnam Avenues was held on May 10, 2018. The Florida Department of Transportation is proposing a partial signalized Restricted Crossing U-Turn, or RCUT, on Philips Highway, providing two pedestrian crossing options: one north of Reba Avenue and the other south of Putnam Avenue.